The fourth major content patch after Final Fantasy XIV‘s Stormblood expansion arrives on Tuesday, September 18th. Titled “Prelude in Violet”, the patch will include a wealth of new content including the continuation of the main scenario and the Omega raid series, new dungeons, trials, sidequests, and many new features. You can check out the official trailer here. With the exception changes to actions in PvE and PvP content (you can read more in the official patch notes, we’ve created a quick reference guide to unlock all the new content and point out some of the major features. 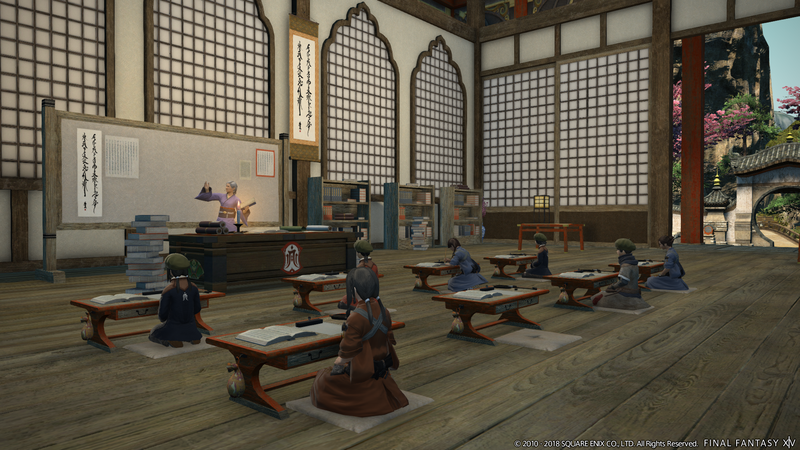 Quest Requirements: After completing the Alphascape raid, speak with the Wandering Minstrel in Kugane (X:11.6 Y:12.6). **Tokens obtained from each floor of the raid to redeem gear can be claimed only once per week. Reward eligibility will be reset every Tuesday at 1:00am Pacific Daylight Time. Quest Requirements: After completing Hells’ Kier, speak with the Wandering Minstrel in Kugane (X:11.6 Y:12.6). Quest Requirements: Complete the Doman Reconstruction. When you a discover a portal after deciphering a gazelleskin map, you will be transported to either The Lost Canals of Uznair or The Shifting Altars of Uznair — the location is chosen at random. Entering the Shifting Altars requires a full party of eight players and your item level will be synced to 370. Once inside you will be presented with a roulette wheel of sorts — with different icons corresponding to different outcomes. Some icons will summon enemies to fight while others will summon Atomos, who will instantly expel you from the Shifting Altars. There are five rounds in total, and should all party members be KO’d before you complete the five rounds, you will also be expelled from the Shifting Altars. Mannequins are available for estates and apartments. These are interior furnishings that can be equipped with clothing items based on what gender, class, or job you select. As of 4.4, only Miqo’te are available as mannequins, but other races will be added over time. They can be purchased from a Housing Merchant in each housing district, as well as apartment merchants and estate maid/manservants. Once placed in your apartment or estate, they can be garbed with gear that is stored on your retainers. A retainer can also be appointed as a merchant for your mannequins, with the ability to sell directly to players who interact with your mannequins. Only sellable items in your inventory, armoury chest, or retainer inventory may be selected to sell. Private chambers and apartments may have up to four mannequins, cottages six, houses eight, and mansions ten. A new GATE has been added to the Manderville Gold Saucer called “Leap of Faith.” The goal of this jumping puzzle attraction is to navigate up various platforms while collecting cactuar trophies placed about. Reach the goal within the time limit and earn 2,000 MGP — fail and earn a measly 100 MGP. You can register alone or with a pre-made party belonging on your same server or world. You can participate by talking to Sabotender Guia at (X:4.9 Y:4.8) in the Gold Saucer. • Adventurer Squadrons — The Wanderer’s Palace (Hard) and The Vault are now available for command missions. A new flagged mission called “Sapper Strike” is also available. Squad members will now earn more experience points through missions. • Battle System — The amount of role actions for jobs has been increased to ten. • Ceremony of the Eternal Bond — 99x Magicked Prism (Glassy Wings) items have been added to the rewards for completing the quest “The Ties That Bind.” New chapel decorations, ceremony favors, and a new gift for guests have been added. You can also sign up to renew vows on an Anniversary. With your partner and your rings in your inventory, speak with Hawu Bajihri at the Sanctum of the Twelve in the East Shroud (X:17.5 Y:18.4). This NPC will also confirm the date of your anniversary, in case you have forgotten it. • Currency — Allagan Tomestones of Genesis have been added for a new tier of gear. The weekly limitation of Mendacity Tomestone acquisition has been removed and Creation Tomestones are no longer obtainable. Existing Creation Tomestones can be converted to Mendacity with Auriana in Mor Dhona (X:22.7 Y:6.7). Allagan Tomestones of Verity have been removed from the game. • Custom Deliveries — By raising the NPC Zhloe Aliapoh’s satisfaction to the maximum level in the Custom Deliveries feature, you will be able to assign her glamours. Rewards have been increased to match those given by M’naago. • Free Companies — Captain rank has been added, which will increase the amount of grand company seals you can carry from 80,000 to 90,000. • Group Pose — New /gpose features will allow you to capture your character in walk, run, sprint or strafe. Mount and minion actions are now able to be toggled. You can also set the time of day and weather. • Housing: Estate Tags — Estate tags have been added for players who would like to denote what type of aesthetic they have styled their estate or apartment around, a useful feature for those who enjoy roleplaying in different types of scenarios. • Housing: New Furnishings — New items have been added including entries from the community-driven Furnishing Design Contest. • The Hunt — To account for the new tier of Allagan Tomestones of Genesis, tomestone rewards for hunts have been adjusted. • Perform — Percussion instruments have been added including the timpani, bongo, bass drum, snare drum, and cymbal. Input settings can be changed to be more compatible with German and French keyboards. • PvP — Seal Rock, Fields of Glory, and Daily Challenge: Frontline no longer require the purchase and registration of expansions to participate. New quick chat options are available in The Feast. Season 10 of The Feast will begin in Patch 4.41. • Subaquatic Voyages — New voyage destinations and items obtained through them have been added. Your free company may now possess up to four different submersibles which may now rank up to 40. • Treasure Maps — Gazelleskin treasure maps have had their reward tables updated with additions and adjustments. • Wondrous Tails — New objectives have been added including: Emanation (Extreme), The Pool of Tribute (Extreme), The Ridorana Lighthouse, Sigmascape V1.0, Sigmascape V2.0, Sigmascape V3.0, and Sigmascape V4.0. Rewards from Khloe have been updated too. • Duty Roulette: Expert will contain the duties The Burn and Saint Mocianne’s Arboretum (Hard). Previous duties in Expert Roulette have been added to the Level 70 Roulette. • Hells’ Kier has been added to Trial Roulette and the Alphascape raids have been added to Normal Raid Roulette. • Hells’ Kier (Extreme) and the Alphascape (Savage) raid have been added to the Raid Finder while The Minstrel’s Ballad: Tsukyuyomi’s Pain and the Sigmascape (Savage) raid have been added to the Duty Finder. • The weekly restrictions on loot and Gougan coins has been removed from The Ridorana Lighthouse. • Weapon’s Refrain (Ultimate) will now have an item level sync to 375 to preserve the difficulty of the encounter. The weekly restrictions on Ultima Totems has been removed. • The drop rate of the Auspicious Kamuy Fife has been increased in the Jade Stoa (Extreme). • The quest requirements “Legacy of Allag” have been adjusted so participation in FATEs is not required to gain access to the Crystal Tower raid series. You will have the option of slaying a requested enemy or by participating in FATEs. These FATEs have also had their locations adjusted. • Echo will now apply to the duty Castrum Fluminis and The Minstrel’s Ballad: Tsukuyomi’s Pain. • Fees for participating in GATEs in the Gold Saucer have been removed. • The schedule for various GATE attractions has been changed. • FATEs involving Typhon have also had their MGP payout increased. • The GATE “Vase Off” will no longer be held at the Gold Saucer. • The cost of Mini Cactpot tickets has been reduced. • The payout for the Jumbo Cactpot has been increased, save for the jackpot. • New prizes, including a Typhon flying mount, have been added for MGP. • New cards and NPC opponents have been added for Triple Triad. • An alarm feature will let you set up to ten alarms that will ring at the specified time. They can be set to local time, server time, and Eorzea time. • An option to reflect quest progression has been added to the Unending Journey. • The mount and minion guides now feature a search bar. • The emotes menu includes a Favorites tab where 20 favorites can be set. • The moogle delivery service menu will now segregate letters from friends, purchases and rewards from the MogStation, and letters from GMs. • A new challenge log entry has been added for completing three command missions per week, rewarding 5,000 company seals. • Input settings can be changed to be more compatible with German and French keyboards when using the Perform feature. • Companion chocobos summoned with Gysahl Greens will remain for 60 minutes rather than 30. • Hells’ Kier is available in the Duty Recorder — the HUD has also been updated. • You’ll get a new emote for registering the Final Fantasy XIV Companion App to your character. • The movement speed for terrestrial mounts can now be increased to two stars in 4.0 areas. • Goobbue, Behemoth, Laurel Goobbue, and Cavalry Drake mounts are now able to fly. The size of the mikoshi mount will now scale to your character. • Redeeming achievement rewards from Jonathas in Old Gridania will open a menu of rewards and he is now marked on the map. • An item’s vendor price is now viewable in the item’s tooltip as well as whether an item is designated for a beast tribe crafting component. • Collectables now have an icon in your inventory to denote them. • A new hairstyle has been added based on a winning entry of a community-driven Hairstyle Design Contest. • The clock in Server Info can now be toggled to a 24-hour mode. • You can now select “Try On” for items you are currently wearing. Final Fantasy XIV is now available for Windows PC, Steam, Mac, and PlayStation 4.